AND ALL THE MEN WE SAW TODAY from Simon Clode / CROWBLACK on Vimeo. 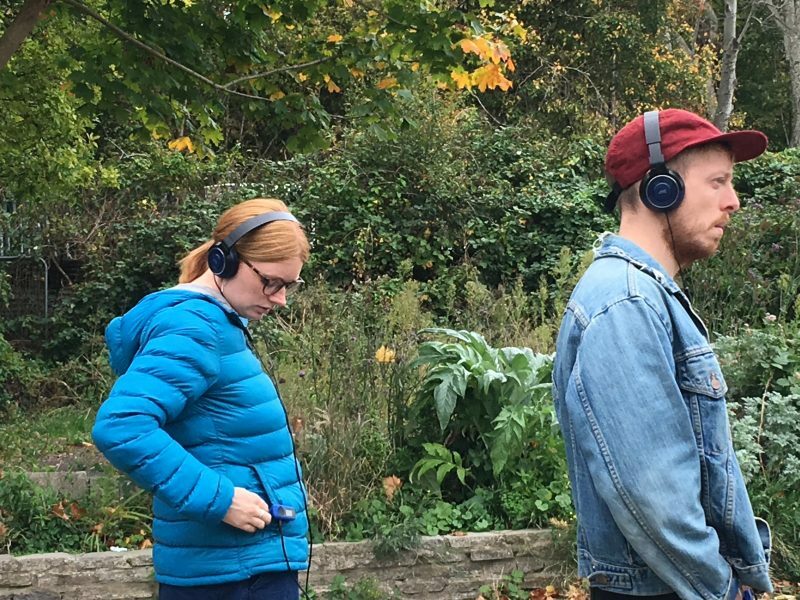 A sensory audio walk by Joanna Young, Kip Johnson and Jamie McCarthy. ‘And All the Men We Saw Today’ has evolved through a creative response to Man Food, a participatory research project looking at men, protein and the environment. This audio walk weaves together first-hand stories of men and food with music, sound and moving. 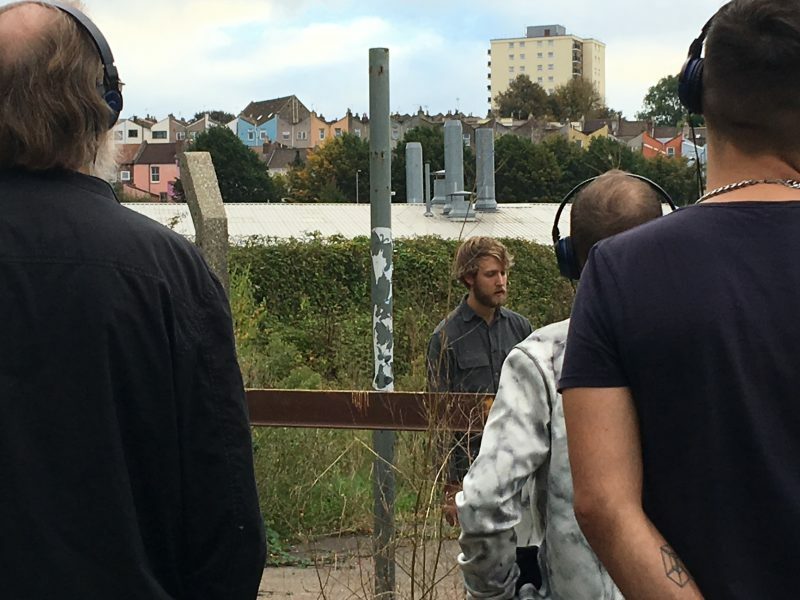 It’s a journey through the streets of Bedminster, Bristol, that opens up a space for reflection. It offers a moment or two to stop, think and feel about the everyday stuff of men, their food and their bodies, that we often take for granted. 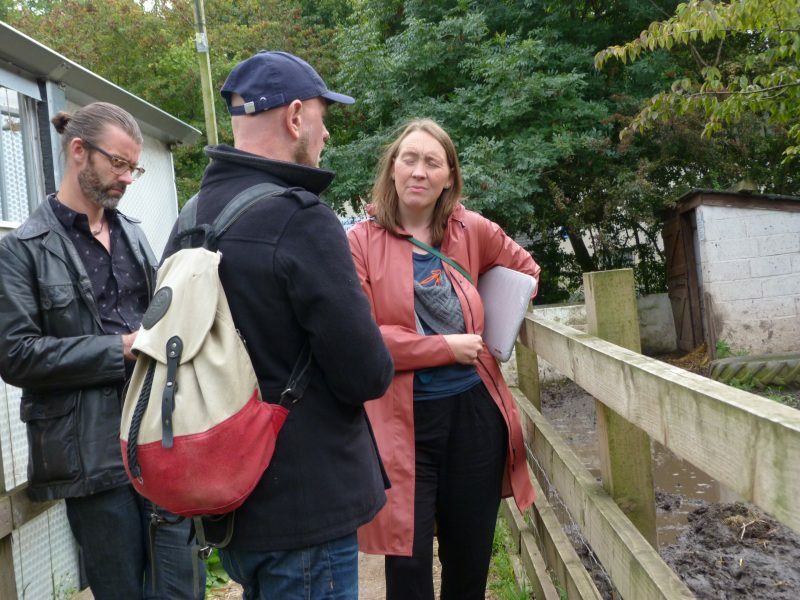 Man Food is led by Dr Emma Roe and Dr Paul Hurley, University of Southampton, with Windmill Hill City Farm and the Matthew Tree Project. If you would like to do the walk in Bedminster, we recommend downloading the three numbered tracks and listening to them in sequence (there are points at which you have to pause to cross roads), and using them in conjunction with the route map and programme notes here. Alternatively, you may wish to listen to the track in its entirety at home or on a train or somewhere else like a podcast. When listening to the track while walking take care when crossing roads and be aware of your surroundings. MEN, MEAT AND THE ENVIRONMENT A lot of work has been done by researchers, organisations and governments on the potential impact of climate change and on strategies to counteract it. Some of these have responded to the fact that livestock production is one of the big contributors to greenhouse gas emissions, and that without addressing livestock production (and consumption) we’re unlikely to reach the targets of the Paris Agreement on Climate Change Action (including limiting the increase in global average temperature to well below 2 degrees above preindustrial levels). Intensive livestock farming also puts pressure on land and water resources, and is a contributing factor to the development of antimicrobial resistance (superbugs) and to widespread habitat and biodiversity loss. WHAT IS MAN FOOD? Dr Emma Roe and Dr Paul Hurley are researchers interested in food and in how we might become not just ethical consumers, but ecological citizens – seeing ourselves as part of a larger human and non-human world. In 2016 they worked on the project Protein Pressures, developing a series of interactive workshops with residents in Hackney, London. They found that men were less likely than women to engage in community food workshops, but also to change their diets for environmental reasons. 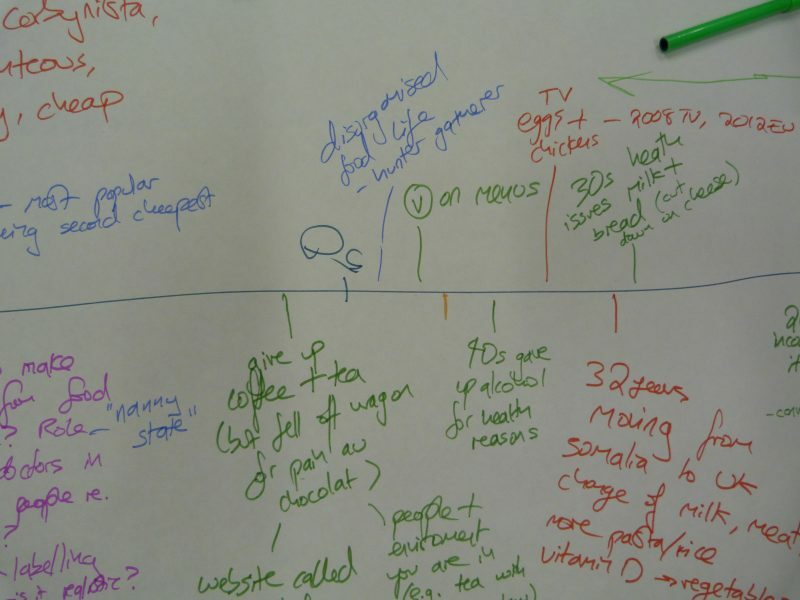 Man Food was devised to explore some of these issues with groups of men in Bristol, in particular self-identified ‘green men’ and ‘men who exercise’, and clients of The Mathew Tree Project (an emergency food aid charity). They wanted to find out whether men make links between what goes on their plate and what goes on in the world, as well as the role sustainability might play alongside taste, health, cost and convenience. ECOMASCULINITIES Man Food has sought to get past some of the stereotypes and assumptions about men’s identities and food practices, and to explore responses to the ecological crisis. We’ve drawn from theories in ecofeminism (in its critique of patriarchy’s subordination of both women and the environment) to see if we can develop a theory of ecomasculinity that connects men with practices of environment caring. 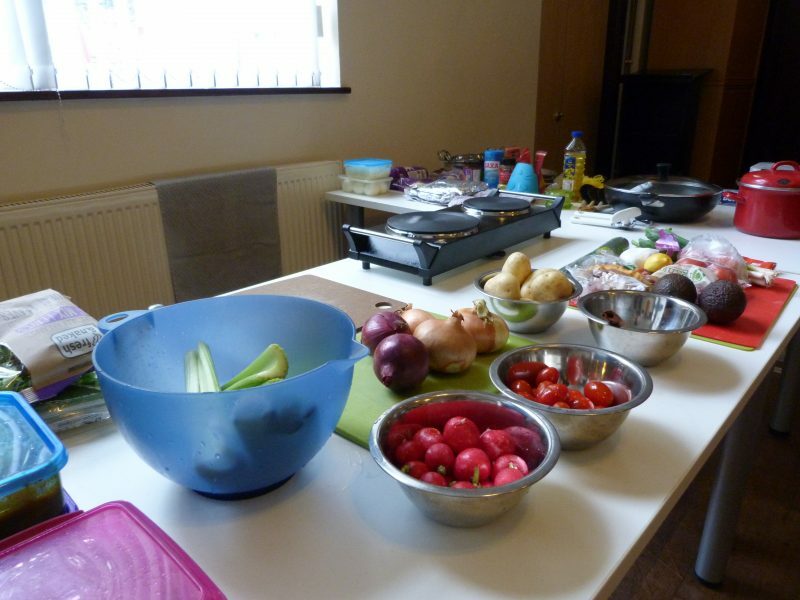 Working with partners Windmill Hill City Farm and The Matthew Tree Project, we held a series of Man Food workshops for men to cook, eat and talk together. While making pizzas, BBQ and veggie chilli, we’ve had had all sorts of conversations – about food animals, about global trade routes, about families, about farts, about feeling socially isolated as a single man, about feeling socially excluded as a vegetarian, about learning to cook, about feeling like a hypocrite, and about what we might be eating in future – from insects and food pills to lab-grown meat. This was a very tender yet challenging experience which has helped me to think physically about my relationship with food and others. It has made me think about how my choices of what I eat encourages a demand for damaging systems and encourages divides with rich and poor food which affects other people's welfare. I found the walk very moving and entirely immersive. More things like this are imperative- we need access to this information more readily. Thank you for composing a space to go and explore an unfamiliar landscape, to understand its many layers of life that pass through. It feels like a gift to have time to consider my personal relationship with food and how this has evolved over my life and to consider what has influenced my choices about what I consume daily... knowing that my choices of what I consume affect the people standing next to me, the people walking by, the people sitting on the train, the people in a city 100 miles away. This moved me. To re-understand that sometimes (most of the time) what I consume encourages damaging systems that affect others and affect animals. On this walk I’ve seen the complexity revealed of how what I eat is woven into expectation, greed, class distinction etc. I feel encouraged to think more and talk with others about why we do eat what we eat… Thank you! An incredible amount of information, covering the complexities of food in our culture. Enjoyed the separation of info into different streets, felt like the thoughts were being mapped out. A wonderfully calm, contemplative, thoughtful hour spent together. Interviewees Radu Lefter | Lee Farley | Finbar Cullen | Servo | Shane Clark | John McCarthy | Kobb | Meehawl Ruach | Chaz & Max.